Watermarking your creation is important in protecting it from unauthorized usage online. There are many watermark software that you can download and each one differs in the features included. 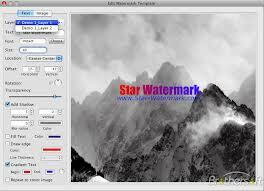 Star Watermark is a free watermarking application for Mac. It can apply watermarks to batches of photos which is convenient if you are working on a lot of photos. It has real-time preview feature and supports all major photo formats. Pros: Free to download, can apply watermarks to batches of photos, simple user interface. Cons: Costs $18.99 for Pro version and $28 for Ultimate version. uMark is an easy to use application for Mac where you can create your own watermarks and apply it by batches to your images of choice. It supports eight languages and you also have the option to save the watermark you created for future use. Pros: Supports batch watermarking, allows live preview, supports eight languages. Cons: Costs $29 to download. iWatermark Pro enables you to add your own personalized watermark to a certain image or photo. 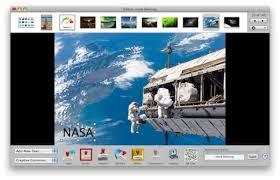 It works with Photoshop, Lightroom, iPhoto, Picasa and other photo organizers. 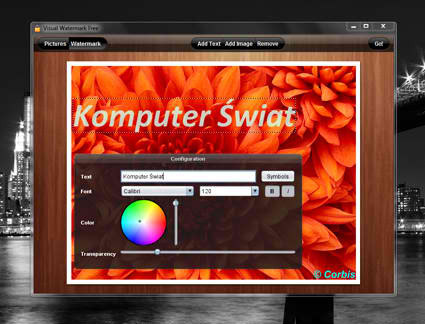 It has many font selections and comprehensive watermark editing tools so you can easily personalize your creation. Pros: Comprehensive editing tools, can edit metadata, supports major file types, continuous online support. Cons: Costs $30 to download, complicated user interface. 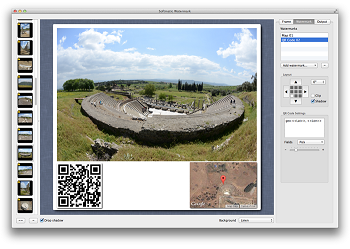 The Softmatic Watermark software is made to stamp texts, images, maps, QR codes and EXIF data as watermarks to selected images. The software can also generate a variety frame styles to complement the watermarks created. This application is ideal for photographers and bloggers. Pros: Supports addition of EXIF data, with several frame styles, can handle large images from HD cameras, can convert file types in bulk. Cons: Costs $0.99 to download, with reported bugs on the drop shadow of watermarks created. 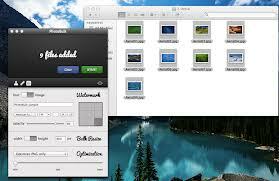 PhotoBulk is an affordable watermark application for Mac. Aside from watermark feature, the software can also resize, rename and optimize a certain image. It can also apply watermarks by bulk. You can personalize your watermarks by using texts, images or scripts. Pros: Cheap at $6.99 price tag, can apply watermarks by bulk, supports date stamps. Cons: Some reported bugs when applying bulk watermarks. 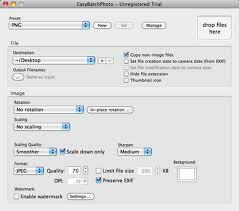 EasyBatchPhoto is an image-editing application for Mac. Aside from watermarking images, it can also compress, crop, resize and rotate the images being edited. The watermarks created can be saved as presets so reusing it in the future will be handy. Pros: With free trial offer from the main website, equipped with image editing tools, can save watermarks as presets. Cons: Costs $14.99 to download full version, with additional fees for commercial use. 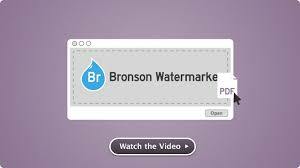 Bronson Watermarker can apply watermarks not only to images but to PDFs as well. You can personalize your watermark by modifying color, font and opacity. The simplicity of its interface made the software famous for most writers and artists. Pros: Simple user interface, works with images and PDFs. Cons: Costs $24.99 to download. 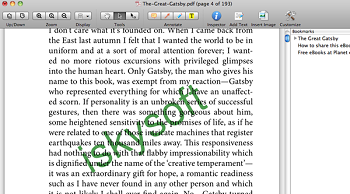 iSkySoft is a watermark application designed for PDFs. Adding watermarks to every page of a certain PDF document is usually a tedious job but with iSkySoft, it will be a very easy task. All you have to do is save the watermark format you want in the software’s settings and load it when opening your PDF document. Pros: With free trial available, simple user interface, can add watermark to every single page of a PDF document. Cons: Costs $49.95 to download, watermark features limited to PDF documents only. Impression 2 can automatically add saved watermarks to photos without altering image quality. Watermarks created are fully customizable and can be dragged in any part of the image uploaded. Pros: Supports custom export formats, simple user interface, allows saving of watermarks created. Cons: Costs $9.99 to download, with crashes reports when using image presets. 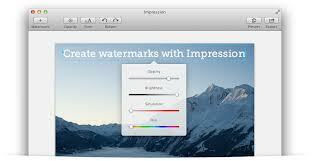 Visual Watermark is a responsive watermark application for Mac. It can apply watermark to batches of photos and the software can automatically adjust watermark sizes depending on how big the image is. It can also automatically rotate watermarks for landscape or portrait photos. Pros: Intuitive user interface, supports up to 40Mpix photo size, watermarks generated are optimized for the web. Cons: Costs $19.95 for personal use, $29.95 for commercial use with 2 computers and $39.95 for commercial use with 10 computers. Adding watermarks is now easy and hassle-free with the use of watermark software listed above. Choose one that suits your budget and image-editing needs so you can fully maximize your resources. Great list. And speaking of watermarking software, have you also also checked out BatchPhoto? It’s a bulk photo editing tool that is quite useful when you have to do resizing, watermarking or adding a date/time stamp.